Fresh. Contemporary. Luxurious. We had one goal in mind when creating this beautiful coastal master bath for the 2013 Hampton Designer Showhouse — capture a contemporary aesthetic while embracing luxurious details with a little coastal flair. 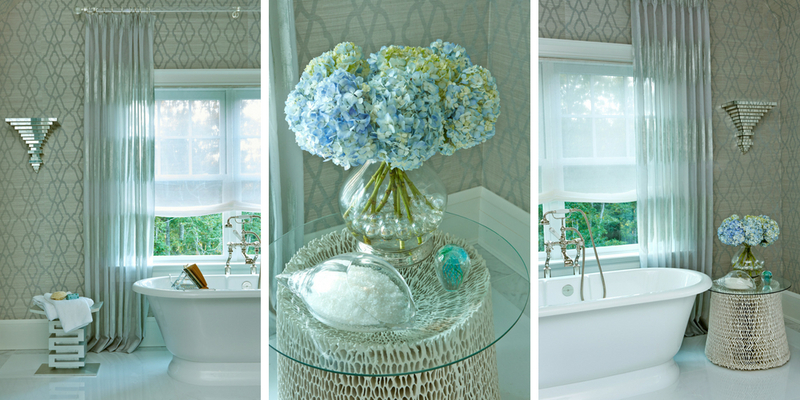 A fresh, bright palette that incorporates neutrals and soft blues was the beginning concept behind this master bath. We decided on a crisp white vanity and ENGLISHCAST limestone blend bathtub, complimentary cream upholstery accents, and lustrous chrome hardware. The soothing blues of the textured trellis-patterned wallpaper wrap the walls, perfectly complementing the bright white finishes while tying in the light gray and aqua surrounding details. The glass shower enclosure allows natural light to radiate through every corner of the room. The acrylic accent chair keeps the vanity open and airy, incorporating cream leather accents for warmth. The floor is a sea of sparkling white Thassos marble anchored by a geometric inset of white, gray and soft blue. The design draws interest to the center of the space where a simple bench and shag throw reside. A custom double vanity with makeup area, topped with Carrara marble, heighten the glamour and functionality of the space. Drawing inspiration from the Hampton beach scene, We wanted to incorporate coastal elements in this contemporary escape. The sculptural accent table beside the tub appears as if it came straight off the coast. Small shell and coral accessories adorn the accent table, makeup vanity and flanking etagere. The crystal beads of the orb chandelier are reminiscent of natural pearls, further emphasizing the elegant coastal aesthetic. 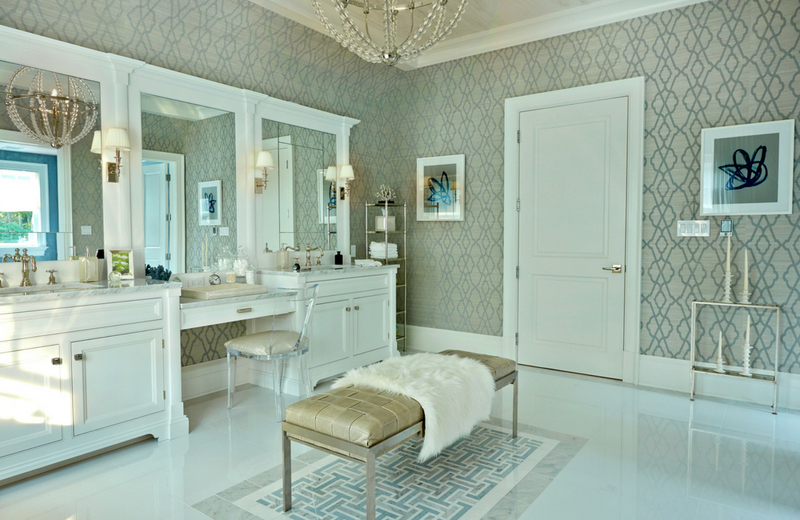 This Master Bath is the ultimate fusion of contemporary aesthetics, luxurious details, and coastal compliments. Tell us, what is your favorite element of this coastal master bath escape? Let us know in the comments below! And to keep up with our latest projects follow us on Instagram! As always, thank you for reading and connecting with us!